Recently, the situation on the market of butter and spreads has dramatically changed. Ukraine was again recognized as one of the world’s largest suppliers of butter. Such growth occurred because of the forced redirection of raw milk surplus that appeared after embargo imposed by Russia, on production of alternative dairy products and, above all, butter. There appeared a huge surplus of butter for exports. Exports grew also due to the significant reduction in butter consumption in the country. 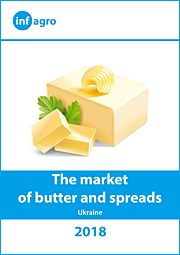 Earlier, in Ukraine when consumption of butter were decreasing, sales of spreads were increasing. In recent years, the demand for spreads has declined both in the domestic market and in the exports countries. As a result, the output of this product in two years decreased two-fold. It is supposed that in the coming years, after a significant collapse, the market of spreads will be growing, but the growth of butter production is likely to stop. We should expect a gradual decrease in exports and possibly even resumption of imports. Thus, the current conjuncture of the market of butter and spread forces market operators to look for effective ways of doing business. The report prepared by Infagro will simplify the fulfillment of this difficult task. Kazakhstan will remain a major importer of butter. Almost half of butter in the country is imported. The report contains 97 figures (diagrams, graphs, maps), 21 tables and detailed analysis, as well as forecasts for the further development of butter and spread markets.